I like relaxing on Friday nights with a good meal, but that’s often complicated by the need to blog said meal. And that’s why I find myself foregoing the fancy Friday night date more and more, in lieu of a simple and companionable dinner. The multi-course tapas blog post can wait for when I’m a little more awake. Though my love for authentic Thai food is undying, I have to admit I’ve developed a bit of a grudging soft spot for its mildly westernised incarnation. 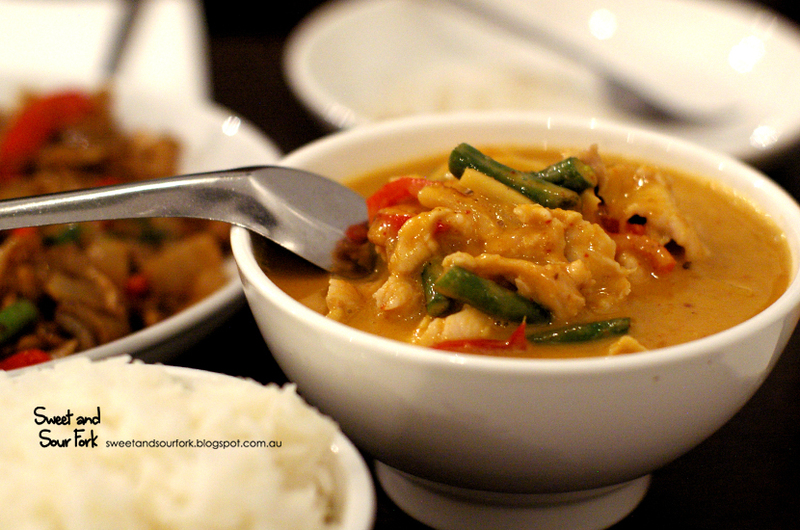 And despite plenty of reviews insisting that Kao Thai is the best and most authentic Thai food in Melbourne, I was pretty sure that at least the second part of that statement is a bit of a fib. Still, that doesn’t bother me as much as it used to, and I was happy to settle for something simple and delicious. 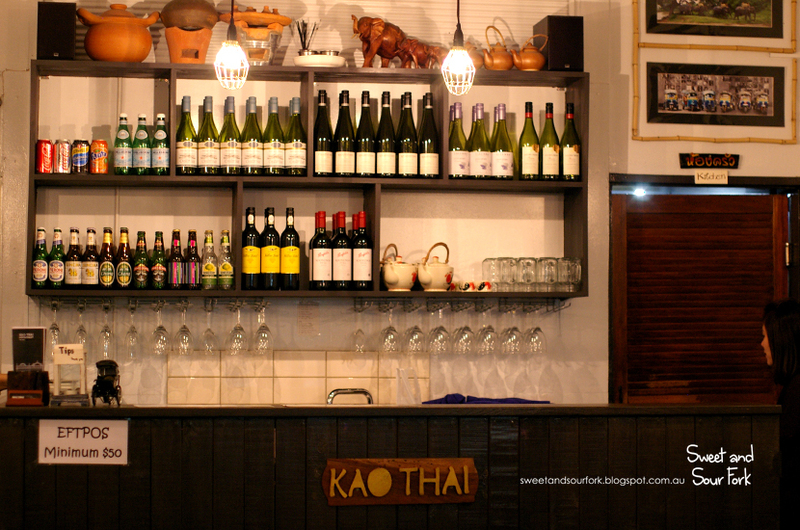 Like most places along Sydney Road, Kao Thai is homely but incredibly cramped. There is however a quiet and pretty little walkway, which led to a quaint sheltered courtyard. Though everything was simple, it was all very welcoming, and none of it was gaudy or overdone. 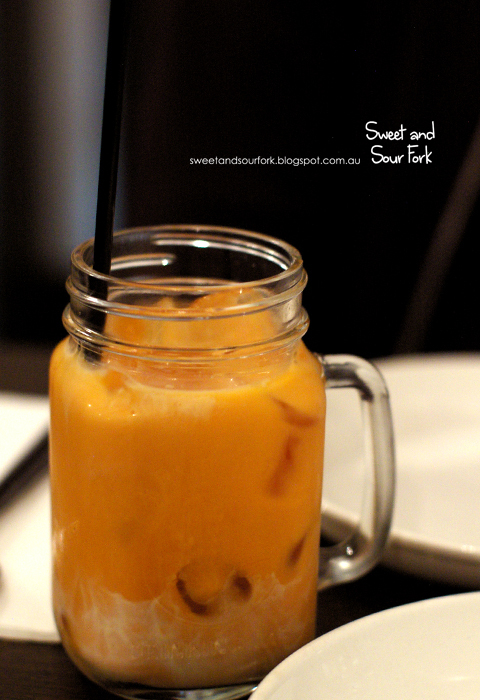 I’m a big lover of Thai Milk Tea ($3.5), but whilst this had the milky sweetness and enticing orange colour, it failed to deliver on the actual tea aspect. If you don’t like tea, you’ll love this tea. 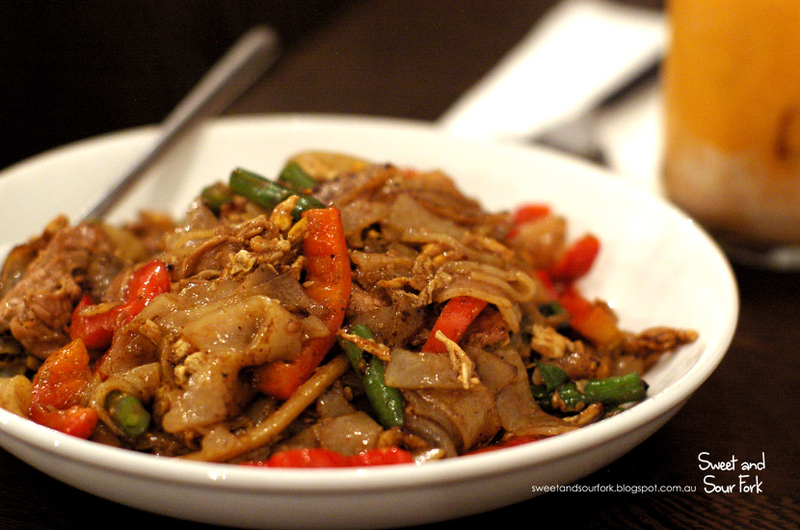 Our plate of Pad Keemao with Beef ($13.9) was rather good. Though the wok-smoke and fish sauce made the rice noodles taste more Malaysian than Thai, the balance was shifted back by the distinct aroma of Thai basil and a small amount of green peppercorns. It was actually very tasty, the mouthfuls of slippery rice noodles going down a treat with the crunch of vegetables and tender sliced beef. 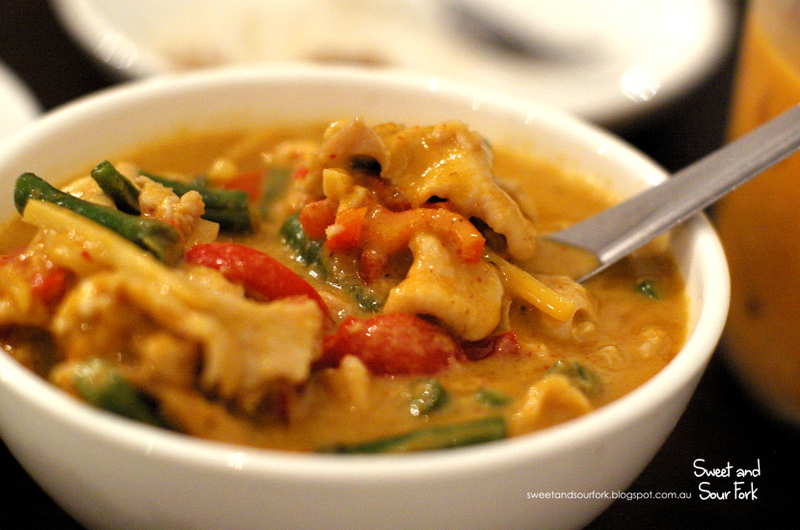 Similarly hearty and delicious was the Red Chicken Curry ($14.9). Despite my initial impression of ‘this is much too sweet!’, the coconut cream actually segued well into a deep, aromatic richness, with just a hint of spiciness. The gravy was well balanced between the warm and comfort of cumin and red chillies, and the sharper additions of lemongrass, kaffir lime, and peppercorns. The chicken was doled out in large chunks, and the vegetables were once again crisp and fresh. There was way too much curry there for a single serve of Jasmine Rice ($2.5), no matter how generously we scooped the sauce on, and I was left dolefully eyeing the remainder. 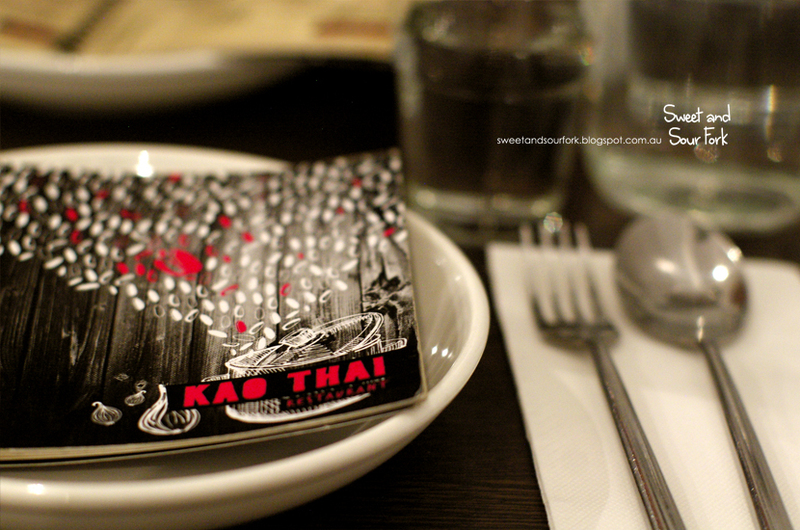 Despite only being semi-authentic, I liked Kao Thai way more than I thought I would. 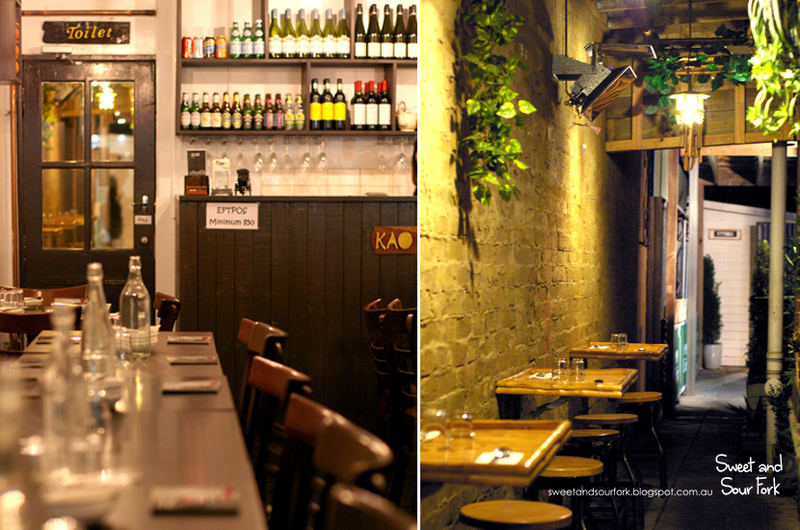 The food was unchallenging and delicious, and sometimes that’s really all I’m after. Rating: 13.5/20 – easy blogging.